My midlife crisis did not lead to me to buy a German convertible — which would assist me in tanning my bald head and at the same time increasing the earth’s albedo — but rather to a rigid exercise regimen. I have discovered my love for running. Yesterday morning I left my hotel room in Berlin on a sunny day and headed towards the Reichstag along the river Spree. And I nearly choked. The stench of Diesel was pretty much unbearable. European cities are living through an “airmageddon”, with concentrations of some of the most toxic particulate matter in major urban centers breaking record levels in recent years on bad days. Part of the problem is the incredibly high penetration of diesel engines in passenger cars. Germany registered 3.35 million new cars last year, of which 45.9% had a diesel engine and 2% had alternative (read hybrid or CNG) engines. The reason for this is that regular gasoline is expensive. 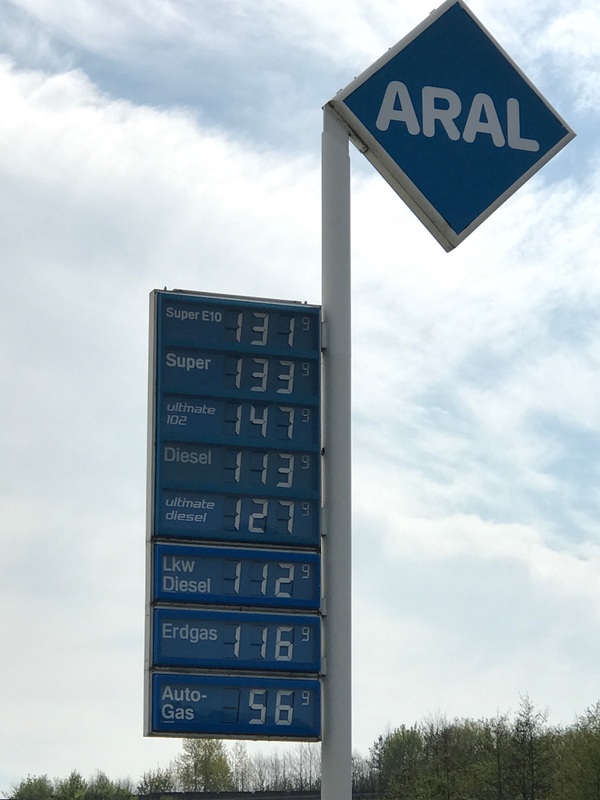 The cheapest gas I could find in Berlin is $5.56 per gallon. A gallon of diesel is $4.58 per gallon. This difference is not due to the underlying cost of the fuel but the fact that diesel is taxed at a significantly lower rate. Also, using a VW Golf as an example, the diesel engine uses roughly 20% fewer gallons (excuse me liters) per mile than a power equivalent Otto (read regular) engine. The upfront price of diesel cars is higher, but for said Golf you break even after 18,000 miles and are printing money thereafter. Plus, diesel-powered cars are fun to drive as even a small Golf has the torque of a small tractor. In theory diesel engines with the right filtering technology and regular checkups and adjustments are “clean”. But there is the problem that not everyone brings their diesel to an annual checkup. Further there is the little problem of criminal and reckless lying of companies like VW on the true emissions of these vehicles. Many European cities have introduced Low Emission Zones, where only the cleanest cars get to drive into the urban core and now some major cities are contemplating banning diesel cars outright from their downtowns. As my former student Hendrik Wolff points out, these policies have been reasonably successful at improving air quality. Really fixing this problem for the Europeans is going to require a U-turn on diesel. A straightforward policy intervention would be abandoning the favorable tax treatment of this fuel. This is politically difficult, as French manufacturers have specialized in the production of small diesels. Any punishment of diesels would be regarded as failure to make Peugeot great again. But why do we not have this problem in the United States? We know that we Californians are just a bunch of regulation-loving outdoor fanatics having massaged kale for breakfast. But this bunch of hippies has historically had the most stringent tailpipe emissions standards in the world. This was made possible by the so called “California Waiver”, which allows California under certain settings to set stricter standards than the ones required at the federal level. These tailpipe emissions standards were impossible to attain with the small popular diesel engines until very recently. And VW only managed to get there by committing fraud. European manufacturers historically had pushed to radically ramp up the increase of diesels sold in the United States. California regulation stopped this invasion of the diesels in its tracks. California was an appealing market for diesel vehicles because at the time they appeared to be more fuel and somewhat more greenhouse gas efficient. Further, under the Clean Air Act other states could adopt California’s standards without seeking approval from EPA (in fact in 2007, Connecticut, Maine, Maryland, Massachusetts, New Jersey, New York, Oregon, Pennsylvania, Rhode Island, Vermont, and Washington had done so, which is of course a large share of the US market for passenger vehicles). Does this mean diesel emissions are not a big deal in California and elsewhere in the US? Of course they are. Big trucks are largely powered by diesels and there are a massive number of trucks on US roads. CARB and the US EPA have done a lot to make sure that the diesel fuel going into trucks has become cleaner by requiring low-sulfur diesel. But is this regulation efficient? Is it working? The answer is that I have no idea. Economists have largely ignored regulation of big-rig trucks. The externalities from these trucks are likely significant in terms of pollution, congestion and accidents. But I am aware of next to no papers in the economics literature which have attempted to quantify these externalities. So what would I like economists to do? Get to work on quantifying the externalities from big diesel trucks. And everyone should light a LED candle in support of the California Waiver. It will need all the support it can get for the foreseeable future. Previous Previous post: Is the Duck Sinking? We need to remember how bad the air was in CA. 1977 and 1979 had 120 days above the Stage I alert level (>0.20 ppm ozone) in the South Coast AQMD. The last Stage I episode was 1998. This despite a more than doubling of VMT. We can get clean air, it just takes some political capital and foresight. One thing that isn’t mentioned is that during the cleanup of diesel particulate emissions using catalytic traps, nitrogen dioxide is produced and consumed by the soot burning catalyst. But not all nitrogen dioxide is consumed by the reaction and leftover nitrogen dioxide, as much as 40-50% of the NOx, “slips” out the tailpipe. Thus, vehicles and trucks produced since the early 2000’s with PM traps and no extra NOx control have resulted in measureable and concernable increases in street level nitrogen dioxide concentrations, a criteria pollutant with health impacts at low concentration and a participant in ozone formation chemistry. Thus, the odor of diesels has changed from the characteristic diesel to one of nitric acid. The use of urea or “blue” fluid in more recent diesels equipped with NOx catalysts should remove the nitrogen dioxide. VW choose another technique to reduce NOx that didn’t require the use of urea and that is where they went to the “dark side” and got in trouble. Mercedes and BMW (I believe) both use urea in their passenger cars since about 2010, but their fuel economy has dropped 10-20% as a result. That loss in fuel economy has tilted the playing field and given the Prius and other hybrids the fuel economy advantage over diesels equipped with PM and NOx control. In the big picture, the issue has evolved into a competition between NOx (NO2 and Ozone) versus carbon (fuel economy). Non academics have looked at many of the externalities of trucks over the years. One important difference is that the required emission control devices are more easily contained in a truck than in an automobile, so they can get their emissions lower. The more important problem is that spark ignition (Otto cycle) engines do not generate sufficient torqued for heavy duty cycles. Hybrids are a possible solution, but even the original hybrid (locomotives) are diesel electric. yes, but in that case the electric is providing the torque. Electric motors have significant torque. Did you see that Tesla is coming out with an electric truck? Yes, even more torque which why they’ve been in use more than 70 years, but hybrids typically give up storage space for energy storage and weight. Locomotives work because weight on rails is less of an issue than it is on highways. 4. The cost of cleaning up diesel (and gasoline) fuel is tiny, and that is why no one bothers doing economic or policy analyses any more on cleaning up fuel. (It does require large capital investments at refineries, but the cost is spread across huge volume). 5. The further regulation of criteria (and GHG) emissions diesel trucks, on the other hand, is expensive and difficult. While new truck criteria emissions are now 99% or so cleaner pre-control, NOx and PM pollution is still high in some US cities, esp calif, and further reductions are needed. Here there is lots of room for analysis. Dan, thanks for the “fact check”. But surely you do not argue that California’s initially tighter standards were not one of the main reasons diesel engines did not take off here two decades ago. Max, there’s a triple negative in there–I can’t track your statement! Energy Institute Blog Save the California Waiver!